If you’re needing a high quality custom branded marquee or popup tent for your event or to showcase your brand, you should consider the proven QuickTop popup marquee. Select either a commercial grade, heavy duty or deluxe grade printed gazebo depending on your needs and budget. Supplied in Australia for 15 years and proven across thousands of applications such as hire companies, schools, lifesaving Australia, Cancer Council events and many other situations, you can rely on these custom printed marquees to give a high quality print job using the latest dye sublimation/ sublimation printing process. This print process is superior to the older style digital print and giving a crisp, clear and UV stabilised image. The folding marquees come in sizes of 3x3m, 3 x 4.5m and 3 x 6m. Each branded marquee is supplied with its own heavy duty carry bag, tie-down straps and pegs. Add additional accessories for even more brand awareness including single or double sided printed walls, flags, half walls and weight bags. The tent fabric for our custom branded marquees is 500 denier PU coated polyester. This is a much more supple material than the heavy vinyl fabric that some suppliers use. This means that with care, the fabric can be left on the frame when folded away unlike Vinyl which creases easily and makes folding the frame more difficult. The PU coating on the polyester canopies not only protects the custom printing from scratching and fading from UV radiation but it also assists to ensure your folding marquee is waterproof. You can relax knowing that your QuickTop branded marquees come with independent engineer certification which is a requirement today at many events. Make sure that if you’re sending us your artwork for your branded marquee, that you use our free artwork templates to assist you in laying our your logo. If you’re not confident to do this we are of course happy to work with you to ensure the best layout of your printed marquee on the roof peaks and valances. Your artwork should be supplied as a vector file so that when it goes to print the image quality remains sharp and crisp. QuickTop custom printed marquees come 4 different range of strengths and weights from lightweight to heavy duty 45mm hexagonal aluminium frames for commercial usage. 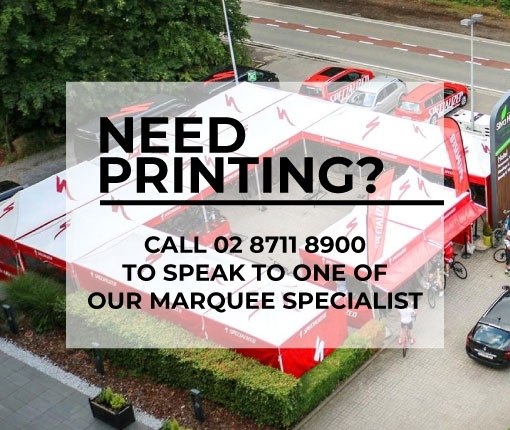 This ensures that you can find a custom branded marquee to suit both your budget and your strength requirement. Shade Australia is known for professional, friendly advice. Feel welcome to give us a call on 1800 155 233 any time during business hours and we’ll do our best to answer all your questions. We always mock-up the artwork and the job only proceeds once you have checked that your artwork is exactly how you want it to look. We take great care in ensuring that you get exactly what you want. Prices are very competitive on our branded marquees and experience tells us not to cut corners. We want to deliver the best possible price package on your branded popup tent so that when you receive it you are delighted with the final result. Super easy to put up. I bought this product a month ago and couldn't be happier with my purchase. Easy and quick installation, strong and sturdy. could not pass up the high upf rating that the product has, the frame is strong as well. Surprized to see the good quality of these popup tents.